You are here: Home / Blogs / Out of the Box / Read Send me another story, please! 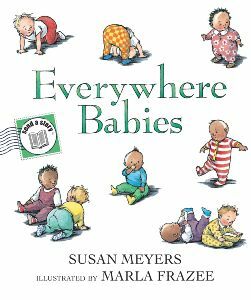 I just got a send-a-story of Susan Meyers’s and Marla Frazee’s Everywhere Babies from thoughtful Houghton Mifflin Harcourt Publicity Director—and Horn Book alum—Karen Walsh. (How did she know I love Marla Frazee?) These genius greeting card/book hybrids allow you to mail an entire picture book to a loved one for less than five bucks and a little extra postage. In addition to Everywhere Babies, send-a-stories are available for Joanne Ryder and Melissa Sweet’s Won’t You Be My Kissaroo?, Debi Gliori’s No Matter What, and my perennial Valentine’s favorite, Sandol Stoddard Warburg and Jacqueline Chwast’s endearingly bizarre I Like You. Sure beats a boring drugstore Mother’s Day or new baby card! I never manage to get it together in time to send Christmas cards, but maybe I can get I Like You in the mail to friends by Valentine’s Day—if I start now.